So, I went to Reen's house to help Jude learn how to parallel park a car, and Reen had just made this delicious recipe for dinner. I was STARVING at the time, so I couldn't resist diving into a big plate of it. I LOVED it! I immediately wanted a picture of it and asked her for the recipe. Thanx to Natalie for typing up the recipe and emailing it to me, and thanx to Will for taking the picture! Oh, and by the way, congrats to Jude for passing his driver's test! 1. Cook the gnocchi according to the package directions. Drain and return them to the pot. 2. Meanwhile, bring a large saucepan of water to a boil and add 1 tablespoon salt. Add the green beans and cook until tender, 3 to 4 minutes; drain. 3. 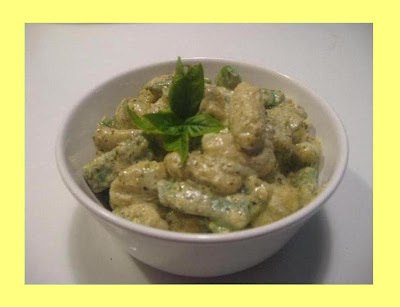 Add the pesto and cream to the gnocchi and cook over medium heat, stirring, just until heated through, 2 to 3 minutes. Divide among bowls and top with the green beans, ricotta, and 1/4 tsp pepper. Try this sauce on any number of differently shaped pasta!